The nerve plant, or Fittonia, is an eye-catching houseplant that is popular for use in hanging baskets, container gardens, and terrariums. Since they are native to tropical rainforests, nerve plants prefer conditions similar to the rainforest floor. But don’t worry, this doesn’t mean that Fittonia plant care requires you to turn your home into a steamy hothouse. Rather, these herbaceous evergreen perennials do great in most regular household environments, as long as you follow a few guidelines for proper nerve plant care. I absolutely love growing nerve plants due to their their unique and stunning foliage. 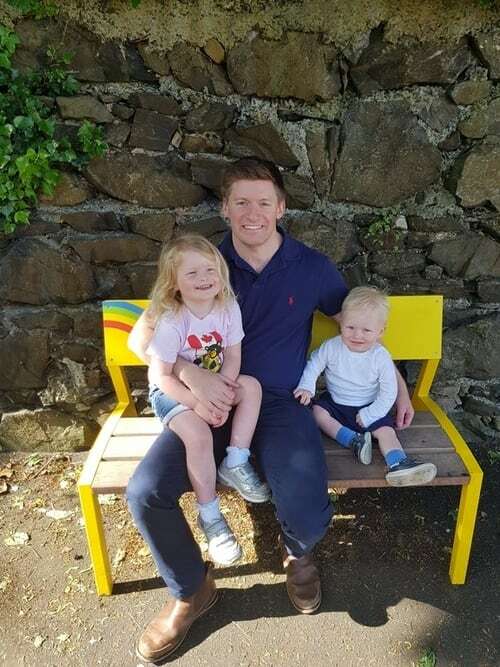 I could never tire of looking at them and they always draw positive comments from visitors. 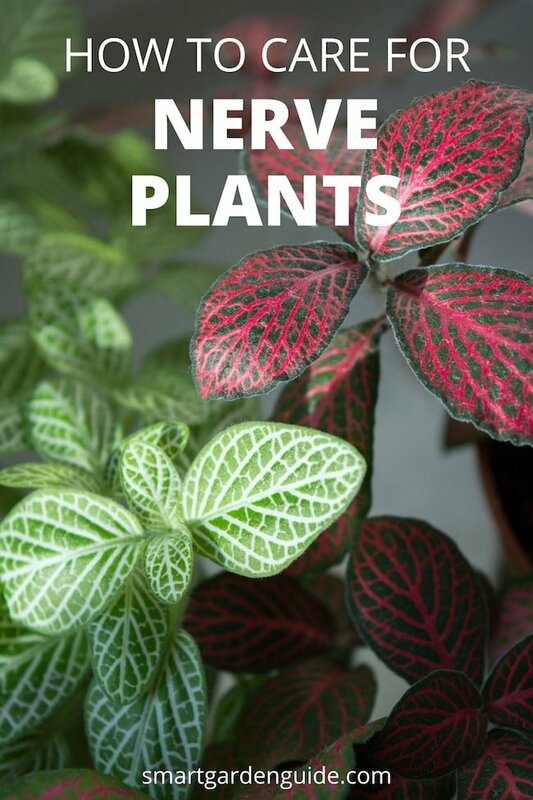 I hope this article will teach you all you need to know to grow a healthy, vivacious, nerve plant. Soil Moist but easily draining. Mix of peat, soil and sand. Water Regular watering to maintain moist, but not saturated soil. Toxicity Non-toxic to cats and dogs and people. The botanical name for the nerve plant is Fittonia albivensis. The genus was named after Elizabeth and Sarah Mary Fitton, two Irish sisters whose lovely illustrated book introducing the science of plants to young people, Conversations on Botany, was first published in 1817. The specific name albivensis literally means “white veins.” Common names for this type of Fittonia, including nerve plant, silver net leaf, silver threads, and silver Fittonia, are descriptive of the intricate leaf veins of this lush tropical plant. Other species of Fittonia have bright pink or red veins. They go by common names such as mosaic plant and painted net leaf, as well as nerve plant. Fittonia plants can be separated into two groups. White-veined nerve plants belong to the Argyroneura Group. Red or pink-veined nerve plants belong to the Verschaffeltii Group. Nerve plants have a dense ground cover growth habit, typically reaching about 6 inches (15 centimeters) in height. Their broad, ovate leaves of about 4 inches (10 centimeters) in length are notable for their striking vein networks. The leaves of standard fittonia plants are a deep green color with contrasting veins, while the various cultivars feature many styles of foliage coloring and leaf sizes, along with different plant sizes. Fittonia plants will occasionally flower, although the buds are usually removed, since the small, white or red-tinged flowers are so lackluster compared to the showy foliage that they’re often considered a waste of the plant’s energy. While they may serve as ground cover in the tropics, nerve plants that are used as houseplants are best suited to be grown in a terrarium or in hanging baskets, due to their need for humidity and their compact size. My personal favorite place to put nerve plants is into a terrarium. The foliage looks stunning, and dwarf fittonia varieties look particularly well. I recently completed a project to make a terrarium in which fittonia plants take a starring role. The only cost was a fairly cheap glass terrarium off amazon, and all other materials were sourced from around my house and garden. It’s a really satisfying thing to do and makes a nice feature in a room. Read this article if you’d like to know a bit more about how a terrarium works and why they are such a fun way to display your houseplants. To get a good understanding of the needs of fittonia nerve plants, it helps to know about the environmental conditions of their natural habitat. Although they’re typically said to come from the tropical rainforests of Peru, nerve plants are also found growing throughout the northwestern Amazon Basin, an area that includes parts of Colombia, Ecuador, Bolivia, and northern Brazil, as well. Nerve plants grow at the level of the rainforest known as the forest floor. Plants that grow at this level are well protected, and this area doesn’t receive much sunlight, since it’s blocked by the thick canopy of tree crowns high above as well as by the understory of smaller trees and shrubs growing closer to the ground. The rainforest floor also tends to be quite humid. With average rainfall between 100 and 120 inches (2500-3000 millimeters) per year in this region of the Amazon Basin, the moisture the rain brings is retained at this level because the canopy blocks solar radiation as well as light, thus protecting the ground from daily changes in temperature that cause the transference of water from the earth and the plants to the atmosphere above in areas that are more exposed. Rainforest soils are usually well draining and poor in nutrients, due to millions of years of weathering and leaching caused by the wet climate. What sustains the vegetation in these soils is the thin layer of topsoil made up of decaying plant and animal remains. These remains are quickly broken down and converted into nutrients by a bountiful array of organisms in and around the soil. Heat and moisture act to speed up this nutrient recycling process even more. As a ground cover plant native to tropical rainforests, nerve plants need partial to full shade to flourish. They do well in indirect, filtered, or dappled sunlight from a window, as well as fluorescent lighting. If these plants receive too much sunlight, however, the leaves will become scorched and begin to shrivel. Although their native habitat is in the hot climate of the tropics, you may be surprised to learn that fittonia plants don’t require high-heat environments. Remember that their location on the rainforest floor is quite shady and protected from the heat of the sun. So it turns out that nerve plants do well at typical household temperatures ranging from about 60-80 F (16-26 C). You’ll know that your plant is too cold if it begins dropping its leaves. So be sure to protect your fittonia plant from cold drafts. And if you are tempted to raise the temperature for your nerve plant by setting it near a heater, resist, as this will harm the plant by quickly dry it out. When it comes to associating tropical rainforests with high humidity, you are hitting on a key element that’s necessary for growing a healthy, happy nerve plant. Without adequate humidity, fittonia leaves will quickly wither and wilt. You can revive your plant by watering and misting the leaves as soon as you realize that it’s suffering, although repeated wilting will stress the plant and eventually cause irreparable harm. There are several ways you can provide the kind of humidity your nerve plant will love. One way is to use a room humidifier. This may be the best method to use during the wintertime, when household heating dries the interior of your home, on top of the drier atmospheric conditions. Check my resources page for advice about what humidifier I recommend. Or, you can create a simple local humidity generator by setting the pot containing your fittonia plant on top of a tray filled with decorative pebbles that you add water to as needed. You may also want to mist the leaves of your nerve plant once or twice a day to provide them with the atmospheric water they crave. If your nerve plant is one of the smaller varieties, placing it in a terrarium or a covered garden is a great way to recreate the humid environment of the rainforest floor and encourage your colorful nerve plant to really shine. To recreate the native soils that the fittonia plant evolved to grow in, you need a potting mixture that is rich in organic matter and that holds water well while at the same time providing good drainage. A peat-based potting mixture, such as African violate potting mix, or a loamy indoor potting soil are good options, since they offer both organic matter and moisture retention. To ensure that it doesn’t become waterlogged, be sure to include a little coarse sand in your nerve plant potting mixture of choice. Always be sure the container your fittonia nerve plant is in has a drainage hole, and never allow it to sit directly in standing water. Fittonia plants should be repotted every year or two in the spring to refresh their soil. Since they have shallow roots, they can be kept in small pots and other tight growing conditions. The roots of fittonia nerve plants need constant moisture, but too much moisture will lead to root rot. To strike a good balance between these two, water your plant as soon as the top of the soil has become dry. Using tepid water to prevent shock to the plant, thoroughly wet the potting mixture and allow it to drain completely. If the leaves of your plant begin turning yellow and limp, it’s a sign that you may be over-watering or that the soil is waterlogged due to poor drainage. If this is the case, you should repot you plant in fresh soil that provides better drainage, making sure to remove any soggy, damaged roots with clean gardening shears, and water your plant less frequently going forward. From spring through fall, you should feed your nerve plant small amounts of a balanced fertilizer every few months. If you use liquid fertilizer, dilute it by half. If you are top dressing with granular fertilizer, you should also be conservative with the amount. It’s important that you water between feedings to flush the soil out and prevent the buildup of mineral salts. And stop fertilizing your fittonia during the winter months. To promote the growth of dense, lush foliage, regularly pinch off the ends of any growing stems and nip flower spikes at the base, unless you like look of the little flowers these plants produce. If you are growing a nerve plant in a small dish garden or terrarium and want to prevent it from sprawling, you should prune back the roots before replacing the plant in fresh soil when repotting. Propagate these plants by taking leaf-tip cuttings, making sure that there are at least two nodes – little marks indicating the base of a bud, leaf, or branch on the stem– on the cuttings. Simply place these cuttings in moist potting mix, set them in a warm, humid location, and keep the soil moist, and they will begin rooting in 2-3 weeks. The best time to propagate nerve plants is in the springtime. 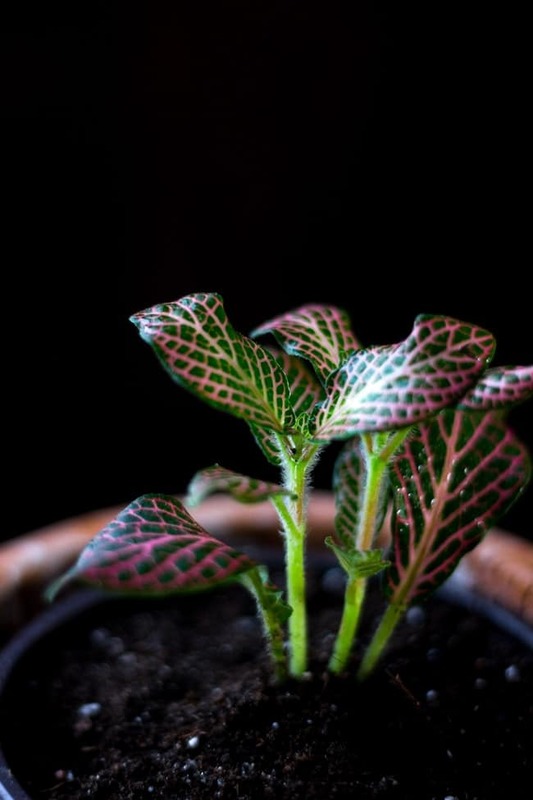 Although not particularly prone to any insect or disease problems, good fittonia plant care calls for vigilance against common houseplant problems such as mealybugs, spider mites, aphids, gnats, and fungus. Treat any infestations or diseases immediately and isolate the plant to prevent the problem from spreading to your other plants. Happily, nerve plants are non-toxic to dogs, cats, and people. 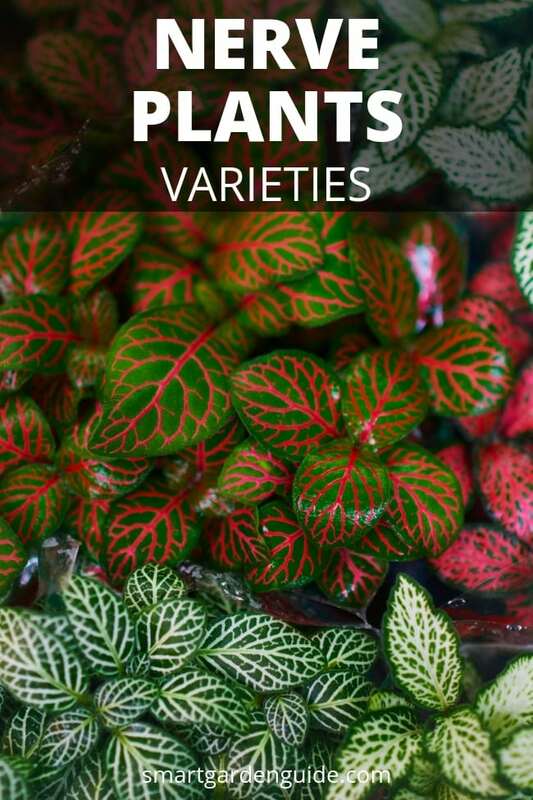 There are a wide variety of fittonia plant cultivars that provide a wonderful assortment of different sizes and leaf coloring patterns to choose from. Here are some common fittonia varieties: Click to see some good example images. Black Star mosaic plants feature foliage that shows off the dark green color of the leaves with fewer deep red veins than there are on other fittonia varieties. Frankie nerve plants are distinctive for their pretty pink leaves with dark green edges. White Anne foliage has bold white veins that stand out against the dark green leaf color. Juanita is a large-leaf fittonia variety with intricate bright red veining. White Brocade is similar to Juanita, except that its large leaves have white veins. Purple Vein is another large-leaf variety that’s light-lavender colored veins contrast beautifully against the dark green leaves. Pink Angel is a compact fittonia variety with small, intensely pink leaves. 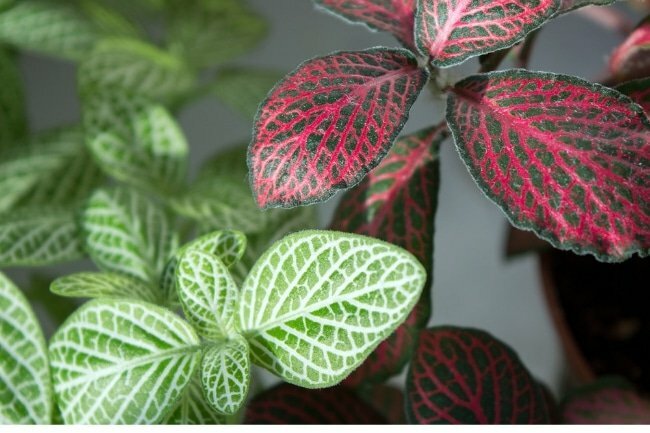 Ruby Red fittonia plants feature richly variegated foliage that’s dark green with richly red colored veins. Mini White nerve plants are small in size, featuring dainty green leaves with white veins. I hope you enjoyed this article about nerve plant care. If you have any questions, please get in touch by leaving a comment below. If you’d like to learn more about keeping your houseplants looking great, check out the rest of my articles, or head over to my resources section. 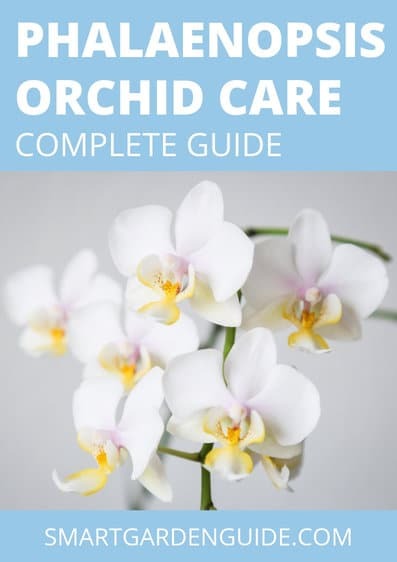 I’ve put together a great collection of books, tools and resources to help you to keep your plants healthy and develop your gardening skills and knowledge. Happy gardening. Very informative. Can you publish on african violets. Please and thank you.